We’d love your help. Let us know what’s wrong with this preview of Let Them Play by Margot Theis Raven. There are 62 official Little League programs in South Carolina — all but one of the leagues is composed entirely of white players. The Cannon Street YMCA All-Stars, an all-black team, is formed in the hopes of playing in the state's annual Little League Tournament. What should have been a time of enjoyment, however, turns sour when all of the other leagues refuse to play against them and even pull out of the program. As the only remaining Little League team in the state, Cannon Street was named state winner by default, giving the boys a legitimate spot in the Little League Baseball World Series held in Williamsport, Pennsylvania. While the Cannon Street team is invited to the game as guests, they are not allowed to participate since they have not officially "played" and won their state's tournament. Let Them Play takes its name from the chant shouted by the spectators who attended the World Series final. Author Margot Theis Raven recounts the inspiring tales of the Cannon Street All-Stars as they arrived in Williamsport, PA and never got the chance to play for the title thanks to the bigotry and ignorance of the South Carolina teams. Winning by forfeit, the Cannon Streeters were subsequently not allowed to participate in Williamsburg because they had not "played" their way into the tournament. To ask other readers questions about Let Them Play, please sign up. What are some lessons we can learn from this book? Author Raven and illustrator Ellison work together to tell the story of 14 All-Star (baseball) Players on their journey to Williamsport for the Little League World Series Championship. A time when the desire to play baseball was "rising high as heat waves," players like Jackie Robinson became role models for black children. However, this was during 1955- a time of segregation and injustice. 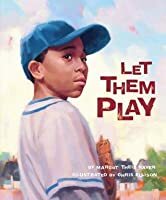 Nevertheless, the children's parents did their best to shelter them from the hate and pessimisitic attitud Author Raven and illustrator Ellison work together to tell the story of 14 All-Star (baseball) Players on their journey to Williamsport for the Little League World Series Championship. A time when the desire to play baseball was "rising high as heat waves," players like Jackie Robinson became role models for black children. However, this was during 1955- a time of segregation and injustice. Nevertheless, the children's parents did their best to shelter them from the hate and pessimisitic attitudes of ignorant bystanders; in South Carolina, the first "all-black Little League" was formed on Cannon Street. Yet, a boycott of Little League organization meant that (view spoiler)[ the Cannon Street Little League which left them as winners by default. However, a title that was worthless when it came to the Little League Championship. < /spoiler> The determination, spirit, and encouragement that Coach Singleton provides as a resolution to this story makes it worth reading. Unfortunately, this book won no awards. Great story of the Cannon Street All-Stars who faced adversity when they tried to play in the Little League World Series in 1955. Segregation and prejudice are highlighted in a way that younger students can understand and process. Personal Reaction: "Let Them Play" is a historical account of a time when a Little League team from segregated South Carolina was banned from participating in the Little League Baseball World Series. It is a different spin on the Civil Rights Movement of the 1950s and 60s in that it touches on individuals that would be the age of the students, as well as a sport/hobby enjoyed by the students. Lesser known activists are introduced, which is refreshing. 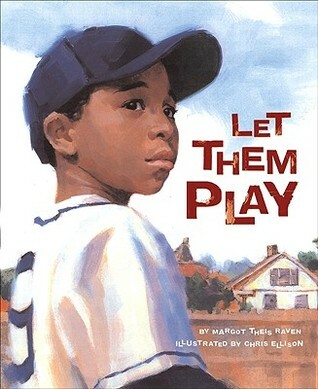 Additionally, the watercolor illustrations a Personal Reaction: "Let Them Play" is a historical account of a time when a Little League team from segregated South Carolina was banned from participating in the Little League Baseball World Series. It is a different spin on the Civil Rights Movement of the 1950s and 60s in that it touches on individuals that would be the age of the students, as well as a sport/hobby enjoyed by the students. Lesser known activists are introduced, which is refreshing. Additionally, the watercolor illustrations are beautiful and add a lot to the story as it is important story to no only hear, but also see, for the full impact. -read aloud for enrichment: The book is a historical account and tribute to the African American community. Students could discuss a time they felt prejudiced or unable to do something they wanted to do, why they were banned, and resolutions. -read aloud for curricular purposes: This would be an excellent model when teaching a unit on Civil Rights. It introduces new/lesser known figures pertinent to the era, such as Jackie Robinson and Coach Ben Singleton, just to name a few. The view of the Civil Movement from the standpoint of a Little League team is fresh and relatable to students. Let Them Play by Margot Theis Raven is based on a true story. This book is filled with emotion and set in South in 1955, during segregation times when African Americans are fighting for civil rights. The focus is on an All Black YMCA youth baseball team, The Cannon Street All Stars. The Cannon Street team become the local winners by default, because the surrounding teams were composed of all white players, and who refused to play the YMCA black league. The team comes face to face with inequality Let Them Play by Margot Theis Raven is based on a true story. This book is filled with emotion and set in South in 1955, during segregation times when African Americans are fighting for civil rights. The focus is on an All Black YMCA youth baseball team, The Cannon Street All Stars. The Cannon Street team become the local winners by default, because the surrounding teams were composed of all white players, and who refused to play the YMCA black league. The team comes face to face with inequality and when they travel to Williamsport, PA to the Little League World Series but are denied their chance to play ball, as a result of the closed mindedness and bigotry they experienced from the all white South Carolina teams. Audience: Grades K-4, readers interested in baseball and its history, readers interested in civil rights history, boys who play baseball, history/social studies teachers. Appeal: This book is a fairly easy read for young and intermediate readers. The pictures are a great addition to the text. The story is quick moving but gets the point across. Readers who enjoy baseball and the history behind the Little League World Series will enjoy the true story of a team making history without playing in the Audience: Grades K-4, readers interested in baseball and its history, readers interested in civil rights history, boys who play baseball, history/social studies teachers. Appeal: This book is a fairly easy read for young and intermediate readers. The pictures are a great addition to the text. The story is quick moving but gets the point across. Readers who enjoy baseball and the history behind the Little League World Series will enjoy the true story of a team making history without playing in the tournament. The story would go along great with a civil rights unit. The true story of the 1955 Cannon Street All Stars, an all black little league team who was boycotted out of the South Carolina championships. They were unable to compete at the national Little League Championships, but were eventually recognized (in 2002) for their achievement. This is a story that will (hopefully) make you cry, and inspire you. This would be a good book for a baseball storytime, but be prepared for the discussion! This is story about a young baseball team that wants to participate in the little league world series. However, because the team consists of all African Americans they are not allowed to play. This story discusses the issues of segregation and how people worked together to fight this war of unequal opportunities. I would recommend this book for 3rd grade and up. The author makes Civil Rights history come alive in this detailed story about the 1955 South Carolina Little League champs. They were only allowed on the World Series field for a brief warm-up because no white team would play against them. It was a little long and too deep for my six year old. If my boys were more into baseball then we'd probably like it more. Great book to read during Civil Rights unit. May capture the interests of students interested in sports. Also the recipient of the Coretta Scott King award. An inspirational true story that provides many opportunities for discussion. Very interesting and fantastic in portraying segregation. Could easily be used for children to learn about civil rights and empathy. A good story line about racism and playing baseball. This book would work as a read aloud and would spark great conversation among students/children. Love this book! It is a good one that boys would be into. Themes: Equality and Tolerance. A very good book for kids. This story is very well written and covers the topic of discrimination very well. What a great book for some great learning and discussions. This book would be great to use during Black History Month. Very informational with nice illustrations.